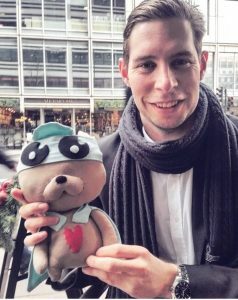 Björn Stjernquist (MSc Finance with a Specialism in Investments) is the founder of and runs, together with two colleagues, Capital Smiles – a powerful crowdfunding platform for charities. Offering a fresh and discerning take on crowdfunding, alongside an interactive and exciting way to get involved directly with charities, they want to shake up philanthropy, put the next generations of supporters closer to the actual projects and enjoy a little innovating alongside their full-time jobs. My time at Cass was really great. Previously, I did my Bachelor’s degree in Economy in Lund, Sweden and that included a semester abroad in Singapore. Studying in Singapore gave me an interest in future studies in the international arena. So after that, I applied to Cass to study MSc Finance for the year 2011-12 along with my friend Anton, and we both got accepted. We moved to the UK together and lived in a great flat in Shoreditch together with a Norwegian guy who was also studying at Cass. I had an awesome time with my Cass friends and enjoyed the rhythm of London and meeting people from all over the world. My Bachelor’s degree was much more academic, so Cass was great in encouraging me to assess different future career options, and meet alumni and make connections in the financial services. It really opened my eyes to new roles and interests. I was also part of MSc diaries, which detailed my typical day at Cass. It was a fun year with a good mix of studies and great parties. What did you get up to next? I got a job offer quite quickly afterwards, with Ernst & Young management consulting in Stockholm, so I left London soon after graduating and moved there for two and half years. Then I moved back to the UK and joined the Strategy and Product Development Team at the London Metal Exchange. I was there for two years and actually the last year of that was right by Cass as they moved to Finsbury Square! Then at the beginning of this year I moved back to Stockholm to take on the role as a Commercial Lead for Santander in the Nordics. At the London Metal Exchange, I worked with a fellow Cass alum and now that I’m back in Stockholm I meet up with Anton and other alumni regularly. Doing your Masters in the UK, you get to meet people from all around the world – people that you can meet up with when you travel, it opens up to world for you! So what is Capital Smiles? It’s an inclusive crowdfunding website for charitable projects. We put the projects through screening and due diligence to make sure we guarantee the charity’s goals and methods are realistic, then we add the crowdfunding effect, giving power to the people. After you have donated, you get a direct line to the team and can follow their progress, get photos and updates. You really know where your money has gone when you do charitable acts through Capital Smiles. We want to make the process of donating more interactive, to offer the chance to support tangible projects, and to be more fun and inclusive. The vision is to have a global platform. We also want to support the exchange of ideas between the charities to share best practice, raise standards and give our projects the best possible flying start. We are offering benefits to supporters and also to the charities themselves by bringing them in to contact with each other. Charities tend to work in isolation, but, for example, if one project looks to build a school in Ghana and someone else has just built a school in Nairobi, there is most definitely useful information and synergies that can assist the new project in realizing their vision. Who is working with you on this project? I have a friend, Mattias Wickenberg who is helping out with tech development, and I also met a great guy in the UK when we shared an Airbnb, Joseph Atkinson, who works with charity and education. We are the three drivers behind it, and we all have full-time jobs. We aren’t doing this to make a penny – although we do aim to take a small percentage for marketing, to help the projects and to run the platform in the future. How did Capital Smiles come about in the first place? I’ve always been interested in FinTech and start-ups and I have also developed a keen interest as to why people are hesitant to donate to charity and why the process of doing so is so dull! Scandals like the Red Cross raising millions and only building three houses don’t help either, and the sector in general is so shaky due to lack of transparency and under-performing initiatives or projects. Many charities are really struggling at the moment, especially in attracting the younger generation to give, when the feeling is that you get nothing back. I wanted to hit two birds with one stone, seizing my chance to be in FinTech and to bring benefits to the charity market. Although charity and crowdfunding it is a tough market, and we will not earn any money, seeing many thousands of dollars being raised to important projects that will change the lives of people living under horrible circumstances is the best payoff one can strive for. When I met Mattias and Joe, we saw that with our combined expertise and capabilities we have a good set of skills to create Capital Smiles and to go from the idea to start making an impact for people! Do you have any advice to someone looking to launch their own project? What is really important is to do something that makes you happy and interested. If you are interested in something you have the chance to also do it really well. Ensure that you work with people that give you energy – because it’s all about overcoming thousands of challenges and keeping on fighting. Good things are hard to achieve and worth fighting for, so don’t give up! Make sure you go from the idea to development, even if it is just trying out the concept in a small pilot, because it’s so easy to get stuck at the idea-stage. For us it’s a combination of getting our name out there and finding that balance between growing the number of projects, whilst continuing to ensure the quality and robustness of the projects we decide to support and list on our platform. We are still very small, but we are looking to compete in the market with the big boys like Kickstarter and Indiegogo, who basically list anything on their sites to increase the volume of donations and therefore their fees. For us, it is more important to ensure that each project we list is genuinely good and has the best chance of providing a high impact in its specific area. And finally, it’s the quick-fire questions! Find all the Capital Smiles projects on their website or follow them on Twitter or Facebook.